La Manga Club is one of the most well-known and prestigious resorts in the world with championship standard golf courses, an internationally renowned tennis centre and an excellent soccer school for kids. Covering an area the size of Monaco, La Manga Club is one of the most well-known and prestigious resorts in the world. No less than three championship standard golf courses, an internationally renowned tennis centre and an excellent soccer school for kids are just some of the reasons why devotees return to La Manga Club year after year. A paradise for sports enthusiasts, La Manga Clubs’ beautifully landscaped grounds, private beach and superb spa make it equally attractive to those simply looking to relax and unwind. With a fabulous selection of bars and restaurants, from authentic Spanish to tempting international restaurants, and all the facilities you could wish for right on your doorstep, you may never feel the need to leave the resort. However, a trip to the traditional Spanish fishing village of Cabo de Palos will be rewarded with some exceptional seafood while the historic naval city of Cartagena is only 20 minutes away. The nearby town of Los Belones also hosts an array of places to eat, drink and shop. And for beach lovers, the La Manga Del Mar Menor, or widely known as the La Manga strip, is only a 15 minute drive away; a renowned strip of land that separates the Mediterranean Sea from the Mar Menor, with beautiful beaches either side. Ideal for families, groups of friends, couples and sport lovers alike, La Manga Club provides the ultimate in entertainment and relaxation year-round. Whether you are looking for an apartment or townhouse where children can easily make friends, or a villa with private pool where you can relax in privacy, we offer a selection of accommodation at La Manga Club. There's plenty to see and do. Use your Holiday Resort as a base to explore new surroundings. Located next to the Repsol petrol station on the Last Drop Junction. With each of the three beautifully maintained championship courses offering its own intriguing challenges and magnificent views, La Manga has unsurprisingly been voted one of Europe’s best golf resorts. The acclaimed Golf Academy provides expert tuition covering all aspects of the game while additional facilities, including floodlit driving range, practice bunker and chipping greens, make it a great choice for players of all abilities. An undulating course sprawling between palm trees, lakes and 'barrancas'. These natural storm gullies feature on all three golf courses and add an extra dimension to the game. Slightly shorter than the South, with tighter fairways and larger greens, the North Course offers a different, yet no less challenging, round of golf. A feature of the greens, all built to USGA specification, is the amount of movement incorporated in them, none more so than the short Par 3, 2nd, which has three distinct plateaux - a great test of putting. Relying on precision rather than length, an added challenge is provided by the wide variety of water hazards and 'barrancas' that snake their way through the course. This gem is sure to provide a stern test of shot making from golfers of all standards. A deft touch is also required on greens. The golf course will be closed due to maintenance on the following dates; 26th June to 30th June 2017 06th November to 08 November 2017 Then on selected days throughout the year for fertilizing, please enquirer for further information on these days. Tuition If you are looking for the unique personal attention that one-to-one coaching provides, you can book private lessons with one of the resident professionals. Private tuition can last for 30 minutes or one hour and usually takes place in the afternoon and at weekends. Originally designed by Robert Putman in 1971 and subsequently remodelled in 1992 by Arnold Palmer, La Manga Club's South Course was completely refurbished in 2004. The Championship course at La Manga Club, the South, is probably one of the fairest tests of golf one can find. At 6,499 metres from the White Tees, whilst being accepted as a top-calibre championship course, also provides a thorough test both for the scratch player and right across the handicap range. Located in the centre of the valley, with wide palm-fringed fairways and water hazards that come into play on 15 of the 18 holes, the South Course holds few hidden dangers. The many strategically positioned water hazards and bunkers will certainly punish any wayward shots. 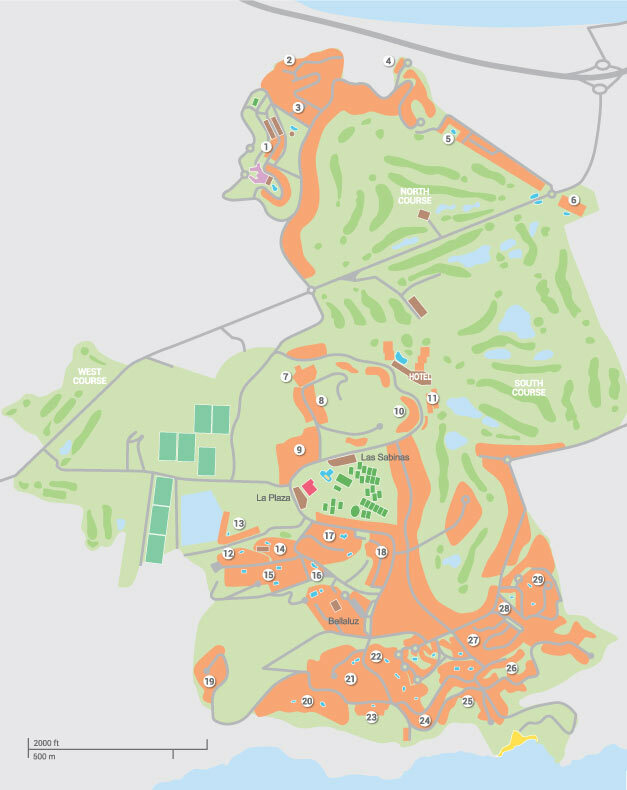 The front nine are particularly tough, with two par 3's over 200 metres and some daunting par 4's which will demand accurate driving between lakes and bunkers, requiring long irons or fairway woods to the green. The back nine, although shorter, has a number of intriguing dog-leg holes. Special attention should be given to both the 11th and 12th holes, which demand precise club selection to greens across water. The large waste area on 14 will provide "food for thought" for most players, and is followed by the par 4, 15th, which fully justifies it's stroke 1 rating. The new stream bordering the 16th Green, now feeds a newly constructed lake protecting the front of the green, which for sure will require 100% concentration from all golfers. The par 5, 18th, with water on both sides of the fairway and a ravine just short of a well-protected green, will prove to be a particularly stern finish. The golf course will be closed due to maintenance on the following dates; 08th May to 12th May 2017 28th August to 31st August 2017 Then on selected days throughout the year for fertilizing, please enquirer for further information on these days. Set amid serene pine woodlands, the West Course's design closely follows the natural contours of the undulating land. Its distinct character makes it a good alternative to the other, more classical championship courses. It is a deceiving course, with frequent changes in elevation with which to contend. The tight front nine demands accurate driving to avoid the 'barrancas' (natural storm gullies) while the back nine, up amongst the hills, is more open but nonetheless challenging. The West is many golfers' favourite, both because of its unique setting and outstanding views and because of the challenge offered by its narrow fairways, frequent blind shots and the gullies which snake through the course. The breathtaking views, undulating fairways and fast greens make this course particularly exciting to play. Unlike a lot of courses, having played here, golfers feel that every facet of their game has been tested to the full. Especially the Par 3 holes, which are a collection of probably the best short holes to be found anywhere on one golf course. Accuracy and good golf course management as opposed to length are very much a premium. The golf course will be closed due to maintenance on the following dates; 13th April to 17th April 2017 11th September to 14th September Then on selected days throughout the year for fertilizing, please enquirer for further information on these days. La Manga is widely regarded as the best tennis resort in Spain, providing a great range of facilities with some 28 courts across three different surfaces. First class coaching, including the latest video analysis to review your technique, is provided by an enthusiastic and experienced Academy team for all ages and abilities. The resort is known for hosting major events and the tennis club has a great community atmosphere and plenty of opportunities to socialise. Hire of a tennis court varies from approximately €20 - €29 per hour depending on season. There is an additional fee of approximately €5 - €6 per person for racket hire. La Manga’s state-of-the-art gym will keep you in trim so you don’t have to worry about over-indulging during your well-deserved holiday. This includes a range of cardiovascular equipment, strength machines and free weights. Facilities also include a stretching area, a consultation room and a physio room. There is an expert team on hand to help you and assess your progress. If you need a little extra motivation, there is an excellent programme of fitness classes from spinning and step to yoga and Pilates, not to mention the fabulous Latin dance workout! Approximately €30 for a 1 day pass, €75 for 3 days, €99 for 5 days and €150 for 10 days. This inlcudes access to the Gym, Saunas, Steam room, Jacuzzis area and Indoor swimming pool. The La Manga Club Cricket Academy is run by John Dye with the help of the Spanish Cricket Director and Junior Director of Cricket, as well as the talented support staff who all have invaluable experience in coaching cricket for the national teams in Spain. The development programme will benefit all ages and aims to give you a little extra knowledge in playing cricket either for fun or at your own local club. The sessions are an enjoyable and fun experience for everyone that takes part and guarantees to improve your cricket skills! Everyone is welcome to take part, boys and girls of all ages, and all equipment is provided. Open during Easter school holidays and mid-July - mid-August (subject to demand - please ask at time of booking). The Dance Academy is for all ages and levels. It is fun, professional and full of energy for those who are wanting to develop as a real dancer or just to have fun. The highly acclaimed resident dance choreographer will transform you on the dance floor! Friday evening sees all the hard practice put into action as the Dance Academy performs to a live audience to start proceedings at the exhibition match between La Manga Club Tennis Professionals and often celebrity guests. Students will also recieve a medal and certificate at the end of the week. Sessions for ages 4yrs+ will primarily involve dance games and movement stories. For ages 7–16yrs+ classes will be predominantly Street Dance but will also involve elements of other dance styles. Open all year round, subject to availability. The junior golf academy is the perfect opportunity to have fun, make new friends and learn golf techniques under the supervision of professional experts. Learn to play golf not just hit a ball on the par 47 course. Open all year round, 7 days a week, 11am - 1pm. Subject to a minimum of 3 participants. La Manga Club is the ideal place for youngsters to develop an early interest in tennis, practise and improve their match skills or put their game to the test in one of the junior competitions. The coaching programme is specially adapted to the needs of children and young people aged from 3 to 19 years, with a variety of group Academy courses and individual coaching available subject to minimum numbers throughout the year. From the Mickey’s Academy for the little ones to the Pro Academy for advanced junior competition players or the age-group tournaments and fun competitions, aiming to encourage youngsters to get out on court, play tennis and develop an active interest in the game. There is also a lively junior tennis social programme during the Easter, summer and half-term holidays with club afternoons, social tournaments and matches for all ages. There is an Adult Academy and Junior Academy both of which are 10 hours per week spread over 5 days. The approximate rates for juniors is €215 - €270 per child depending on age and for adults €255 - €300 per adult depending on season. Led by the 6 Nations champion, Welsh International rugby player Michael Owen, with the programme personally devised by him, based on a fast, fun-filled game centric approach that covers all aspects of the game. The week is available for children between 9-16 years, structured around two daily themes such as Attacking, Tactical Appreciation and Game Understanding, Contact Skills and Decision Making in Defence, Evasion and Speed, Agility and Balance. As well as this, there will be specific skill drills covering core areas such as kicking, passing, tackle technique and handling. The focus will be on development through enjoyment and the programme will be tailored for all abilities, from those who look to come along for the love of sport and exercise to those who are looking for more elite, detailed coaching. Open during Easter school holidays, May half term week, 26 June - 1 September 2017 & 16 - 27 October 2017. La Manga is recognised as one of the best football training centres in Europe, often hosting training camps for some of the world’s top professional football teams. As such, there are first class practice facilities in resort. Soccer schools for children aged 3-16 are run here, with tuition by Nick Watson, a top FA and UEFA qualified coach. For older kids aged 7-16, there is also a fantastic goalkeeping academy. There is also an Advanced academy for players aged between 13yrs and 18yrs, as well as a Senior academy for the over 35's. An Advanced Soccer Academy and Goalkeeping Academy are also available. La Manga Club also hosts fun mini-football tournaments for boys and girls aged 7-16 years, run by their FA or UEFA qualified football academy coaches, which gives you the opportunity to play on some of Europe’s finest pitches, as used by England, Spain, Real Madrid and Bayern Munich. Vary depending on the age of the child and are approximately €195 - €280 per week (Monday - Friday). One of the greatest attractions of the La Manga Club is the wide range of sports and leisure activities the resort offers. Golf and tennis are all-time classics, but you will also find the facilities for bowls, cricket, football and rugby. In addition, the superb climate and natural surroundings make La Manga Club the perfect destination for outdoor activities of all kinds: water sports, trekking, and mountain biking. While mums and dads are taking a little time off, rest assured the children will be having the time of their lives! La Manga Club offers the best in holiday fun and excitement for kids of all ages. The dedicated kids’ club offers all kinds of activities from puppet shows to crazy golf, face painting to movies. It’s a great place to make new playmates and burn off some energy! Available to children up to 12 years old, it features a variety of games, sports and activities organised daily and supervised by trained staff. Kids Club bookings will need to be made 24 hours in advance. Open all year round, Monday - Friday, from 9am - 6pm, except in July - August when open 7 days a week. Music, puppets, crafts, songs, stories and more around a different theme each day. Approximately €60 for a half day, €85 for a full day, €210 for a weekly* session of half days and €295 for a weekly* session of full days. Sports, Wii and PlayStation competitions, pool parties, orienteering plus a chance to put those creative skills to good use in some clay, eco and cookery workshops. Approximately €50 for a half day, €75 for a full day, €1750 for a weekly* session of half days and €255 for a weekly* session of full days. There's a different theme every day - such as Master Chefs, Super Mario Bros, Harry Potter, not to mention sports, pool parties, workshops and more. Games, music, stories colouring, drama, crafts, sports... Plus a different theme every day, such as pirates, pop stars, medieval etc. Set over two exquisitely designed floors with breathtaking views, Spa La Manga exceeds even the most discerning spa-goer’s expectations. For head-to-toe indulgence, unwind in the sauna, steam room or Jacuzzi and take your pick from the range of rejuvenating beauty treatments and therapeutic massages available. You are sure to leave feeling totally relaxed and reinvigorated. La Manga also now has a new Thai Spa area with two experienced Thai therapists offering a range of therapeutic and pampering oriental massage treatments. No matter where you are staying on La Manga Club, you will have access to a communal pool. The large pool at the Oasis Tennis Centre (seasonal opening - usually July & August only) is open to everybody staying on La Manga Club; it is free to use and has an onsite cafe but there is a small charge locally for hiring a sun lounger. Properties that do not have their own private pool have access to communal swimming pools. These are located within each villa community, and each pool is available exclusively to the surrounding properties. The pools are all built in a freeform style and offer sun loungers where you can relax in the sunshine. If you are staying in the communities of Los Olivos or Monte Verde (except the Monte Verde villas with private pools), you have the added benefit of free access to an indoor heated pool within the community. However, guests not staying within these communities on La Manga Club can use the indoor pool at the Spa for a small local charge. Open July & August only. If you fancy a break from self-catering, you will find an excellent choice of over 20 restaurants and bars at La Manga Club, with a vast array of cuisine on offer from Asian to Italian, and Spanish to American. Whether you sip a leisurely cocktail at the sophisticated piano bar or join friends at the Irish pub, there’s live music and evening entertainment to suit everyone’s taste. If that doesn’t whet your appetite, 5km away in the town of Los Belones, is a further selection of restaurants of varying cuisines, or head to the fishing village of Cabo de Palos for unbeatably fresh seafood. Please note that some bars and restaurants on La Manga Club are open seasonally, and some are so popular in high season that you may need to book. Hotel La Manga Club Príncipe Felipe's signature restaurant, serving the most exquisite Mediterranean cuisine. Stunning terrace and fine golf course views. Open 7am to 11am; 1pm to 4pm; 7pm to 11:30pm. Lively steak house and grill restaurant La Manga Club Tennis Centre. Open 6:30pm to 11:30pm all year round. Located at Las Sabinas, Asia offers the exotic flavours of South-East Asian gastronomy including vegetarian specialities. The Terrace is open in summer. Enjoy breakfast, tapas or lunch while you take in the views across the golf course. Open 7am to 7:30pm all year round. The perfect spot for breakfast or a sandwich while you enjoy the views. Open 7:30am to 7pm October through June and 7:30am to 11:30pm July through September. Located within Plaza Chica, in Bellaluz, Abela Teresa offers an authentic Spanish menu for lunch and evening meals. Open for breakfast, lunch and dinner, El Bistro is situated in Plaza Mayor, in Bellaluz. Situated between the 9th and 10th holes on the south course, it is the perfect place to have a refreshing pick-me-up before completing your round of golf. At Las Lomas - Chic Indian cuisine in the restaurant, whilst pre and post dinner drinks and cocktails at Bar India. At La Plaza near the Tennis Centre. Enjoy the finest Spanish wines accompanied by delicious tapas in this typical bodega. Nestled on a rocky outcrop overlooking the sea, La Cala serves fine fish and seafood with spectacular Mediterranean views. Salads, sandwiches and light lunches alongside Las Lomas pool. Open 11am to 7pm June through September. Closed October through to May. Enjoy a light snack or cold beverage on the sunny terrace beside the West Course. Located near the centre of the resort, La Finca is the exclusive yet affordable home of rustic dining in La Manga Club. Family-run, it is proud of its high standard of food. Open all year round for dinner. Located on the way to the West Course and very well-known for its steaks. Seasonal pool bar at Los Molinos, known for its great lunches and good service. At Hotel La Manga Club Príncipe Felipe. Great atmosphere, live music, sensational cocktails and snacks from around the globe. The Lobby Bar at Hotel La Manga Club Príncipe Felipe is the ideal meeting point and the perfect place to relax over a sandwich, light snack or refreshment. Located at Las Lomas Village, Luigi's serves pizzas, pastas and Italian specialities the whole family will love. Open 5:30pm to 11:30pm daily, all year round. Traditional pub at La Plaza near the Tennis Centre. Giant screen TV offering the best live coverage of all the top sporting events, live music and karaoke nights. Wide selection of beers, delicious snacks and a large terrace / beer garden. Evening meals served in February, March and October. Great value breakfast, lunch and dinners. Bar and big screen, with evening entertainment plenty for the kids too, including Pool, Table Tennis and large sun terrace for the adults. What could be better on a warm summer's day than an ice cold drink or ice cream by the Tennis Centre pool. Be sure to try the delicious salads, sandwiches and snacks. Open July and August throughout the day. Right next to the hotel pool, serving fresh-grilled specialities, sensational salads, sandwiches and snacks. Open 10am to 5pm in April, May and October; 10am to 9pm June through August. Located in the Tennis Centre, Tie Break is ideal to help regain strength after a match with a fresh natural juice or light lunch. Tie Break also has a terrace and WiFi. Open 9am to 7pm March through to October, closed November through to February. Located in the Bellaluz Community, fresh home-made pizzas to eat in or take-away. A taste of the USofA at La Plaza. Great choice of steaks, ribs and burgers as well as wickedly delicious desserts. Open 6:30pm to 11:30pm June through September. Overlooking the picturesque West Golf Course, offering snacks and drinks on the terrace. Modern restaurant, sushi bar and gin club situated in Las Sabinas. Enjoy light lunches such as salads and sandwiches during the day time and a fantastic evening menu. Plus downstairs is a chic gin bar and nightclub open late into the evening. Serving pizzas and pastas and other Italian food Open all year/ closed Sundays, situated in Las Sabinas. Serving food all day including breakfast. Situated in Las Sabinas. Enjoy infusing Indian spices on the La Manga Club with The Curry Gardens open all year round as a dine in or takeaway service. Newly opened modern dance club situated on the La Manga Club with sax players and trendy vibes. Supermarket open 9am – 9pm Monday - Saturday and 10am – 2pm Sunday in the summer only and 9am – 8pm Monday–Saturday in the winter. Sundays closed in winter. A range of shops are available in resort offering a selection of goods and essential supplies. The shopping village of 'Las Sabinas' is located near the Monte Claro community and the resort centre, and here you will find a bank with ATM, a post office, doctor, hairdressers, the main resort supermarket as well as various gift shops. In 'La Plaza', within the resort centre, nearest the communities of Los Olivos and Hacienda del Golf, you will find the petrol station, para-pharmacia and the taxi stand. Bellaluz Square also hosts a variety of amenities including a supermarket, chemist, tobacconist, a jewellers as well as some other delightful boutiques. La Manga boasts its own private Mediterranean cove, La Cala. This attractive, secluded beach is set against a stunning backdrop of cliffs, accessed by car, with a beachside restaurant specialising in deliciously fresh Mediterranean seafood. Wi-Fi is available at many bars & restaurants around the resort. Generally free of charge when eating/drinking there. Up to €200 resort credit per booking when staying at Las Lomas Townhouses and Apartments - When staying 5 - 7 nights €100 credit voucher applies, exchangeable at selected establishments. 93% of 1368 customers would travel with us again. Minster on Sea. Couple with my sister. Excellent location for a view of The Mar Menor and Strip. The location of the property is on a hill. After one walk out we had to take the car as it was too so this difficult for my husband. The apartment had everything you wanted. The sun beds need to be changed as the blue from the fabric came out on my clothes. The beds were only charged once a week and the cleaning too. Just as well we are tidy and clean people. A gorgeous apartment with so much space inside and out. Very well kept, clean,tidy and well maintained. Everything we needed. Pool towels a big plus. Mid week change was great. Only thing lacking was hooks in bathroom! Villa exactly as portrayed in writing and pictures. Very comfortable and homely. Loved all the balconies and the different views. We did not use the pool however it looked lovely. Well positioned close to activities, facilities and restaurants. We loved Casa Mimosa and the views from the terrace. Lovely spacious villa in a great location. Outside space was very good and safe for children. However, we did feel that some of the furnishings and decor could do with updating. Also, some of the electrical appliances need replacing. The microwave turntable did not revolve which is not safe. The washing machine only has a 600 rpm spin which suggests it is quite old. Overall though we were happy with the villa for the amount we paid and could not fault the service from James Villas. This villa is beautiful, the living areas and outside space are perfect. The beds are a bit hard but everything else is great. The kitchen is fully equipped, it has more than any other villa we have stayed in. It was really clean and can find no faults.